"We are ramping up to return to Laughlin for the UTV World Championship in 2018 and I know this will be another record breaking year. 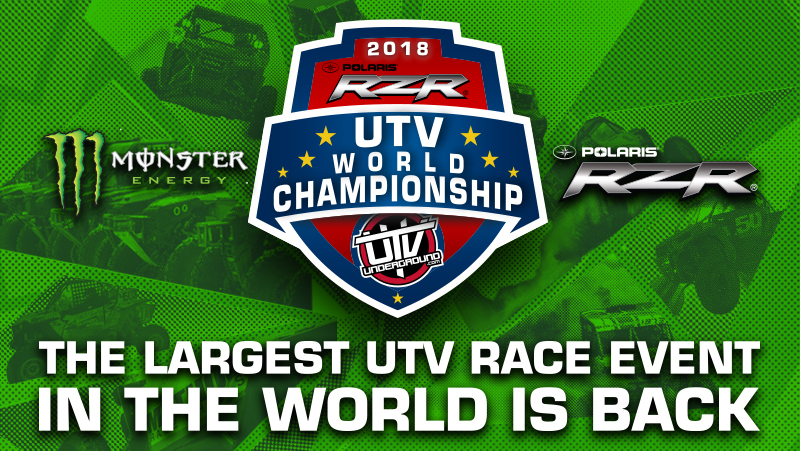 Developing the UTV World Championship into the world's premier UTV race event has been amazing, and returning for the 4th year in a row to host this event has us really excited," said UTVUnderground.com CEO, Joey DiGiovanni. "Since creating the UTV World Championship in 2015, we have remained committed to giving racers, companies, and all those involved in UTV recreation an event they can all come together at. With the sport at an all-time high, this years’ event will be one of the top off-road race events in 2018. Of course, we could not do this without support from Polaris RZR who is coming back as title sponsor for the fourth straight year. We also welcome back Monster Energy who has been an amazing partner since we launched the event!" The Polaris RZR UTV World Championship Powered by Monster Energy has enjoyed three years of uninterrupted national television coverage with 2017 coverage appearing on ABC’s World of X-Games. With multiple hours of national programming, as well as exposure all over the globe through various industry print, online publications and social media, the Polaris RZR UTV World Championship Powered by Monster Energy has boosted UTV racers into the mainstream. In 2018, the UTV World Championship is planning increased spectator and enthusiast interaction, including trail rides to pair with the Poker Run which allows fans and racers to take their vehicles through the UTV World Championship race course. Also returning in 2018 will be the inclusion of the Youth Production Race for competitors ages 6-12. This race has given the future of the sport an opportunity to shine on the industries biggest stage. Of course the massive Short Course & Desert Races will be the highlight of the weekend. The UTV World Championship has become the go-to event for companies looking to showcase their products in front of the industries best racers, teams, fans and thousands of UTV enthusiasts. In place for 2018 is the return of the industries largest UTV Tech & Contingency in the front parking lot of Don Laughlin's Riverside Resort & Casino - where hundreds of the sports best brands are able to showcase their products while mingling within the festive atmosphere. The UTV pit crew challenge will also return as the finale of the day long Tech & Contingency. The Polaris RZR UTV World Championship Powered by Monster Energy Returns To Laughlin, NV April 5th, 2018. Come bring your family and friends to race, spectate, shop, and party at the UTV World Championship!